The 2018 Chevrolet Silverado offers up all the ruggedness and capability you demand from a full-size truck, but in a more conservatively styled package than you get from Ford, Ram and others. Inside the Silverado you'll find trim levels ranging from comfortable-but-basic to all-out luxury in the High Country models. With an enormous range of options, features, trims, bed and cab sizes, you can order a 2018 Chevrolet Silverado in just about any configuration you can possibly imagine. If you want to drive a truck, and not make a fashion statement, the Silverado's conservative styling will likely be appealing. The Chevy Silverado is resolutely mainstream, so if you're looking for advanced powertrain and construction, the F-150 and its aluminum structure and turbocharged V6 engines are more cutting-edge. The Ram 1500 and Nissan Titan offer a diesel engine. The Chevy Colorado is less expensive, surprisingly capable and offers a diesel engine. A host of modest changes graces the 2018 Chevrolet Silverado. The mild-hybrid eAssist package is now available nationwide on LTZ and LT models, the tire-pressure-monitoring system includes a fill alert that tells you when you've reached the right pressure, and the rearview camera is now standard. Base models of the 2018 Chevy Silverado benefit from the same sensible layout, ample storage, and nicely textured plastics as the rest of the lineup. That's not to say there aren't benefits for paying more; move up the trim ladder and you'll get even higher-end materials, and the top-of-the-line High Country lays on the luxury nice and thick. Beyond creature comforts, there are three cab sizes to choose from: traditional regular cab, a double cab with some extra space behind the front seats, or the crew cab, which can seat up to six in surprising comfort. Like any modern truck, the Chevy Silverado boasts rugged and distinctive exterior styling. Yet it doesn't go overboard, instead presenting a relatively conservative face to the world compared to its sometimes garish competitors. Granted, the Silverado LTZ grille is a big chunk o' chrome, but the rest of the lineup is more tasteful and subdued. The High Country offers a more luxurious take on the full-size pickup, and it looks the part with generous -- but tasteful -- uses of chrome. Unlike the F-150, the Silverado doesn't offer a built-in stepladder, but it does offer an optional rear-bumper step. The idea of trucks being uncomfortable and noisy is as outdated as bipartisan legislation. The 2018 Chevrolet Silverado glides along the highway, quietly despite its boxy design, and smoothly despite its old-school leaf-spring rear suspension. The Silverado's suspension soaks up big dips with ease, although that same capability also means it's sometimes floaty off-road or around town. The steering on the other hand feels nicely weighted, and with enough angle that the Silverado is more maneuverable than you might think. Of the three engines available, we recommend the 5.3-liter V8. The V6 offers better fuel economy but feels sluggish, while the 6.2-liter V8's extra power isn't enough to offset its fuel-economy hit. The 8-speed automatic translates to fuel economy that's close to the EcoBoost V6 in the Ford F-150, but unfortunately throttle response feels particularly lazy. Regular-cab prices aren't yet available, but the Manufacturer's Suggested Retail Price (MSRP) on a Double Cab Work Truck starts at $33,405, including the $1,295 destination fee. On the other end of that scale, a 4WD Crew Cab, standard-box High Country Silverado is just under the $57,000 mark, and that's before you start adding options. Of course, you can get pretty much anything you want for considerably less, or more. Regardless, prices are in the same general range as the F-150, Ram 1500 and the Silverado's GMC sibling, the Sierra; the V8-only Toyota Tundra starts a few thousand higher. Be sure to check the KBB.com Fair Purchase Price to see what others in your area are paying for their new Silverado truck. The 2018 Silverado is expected to retain its value well in the years ahead, but still fall short of the Toyota Tundra. Newly standard on the 2018 Chevy Silverado are a rearview camera and a tire-fill alert that honks the horn to tell you when you've reached the right inflation pressure. Otherwise things aren't much different from last year. The basic Silverado WT -- that stands for Work Truck -- comes with air conditioning, power windows, cruise control and AM/FM audio system with a new 7.0-inch display, auxiliary jack and SD card. Also standard are multiple USB inputs, Teen Driver safe-driving system, projector-beam headlights, LED accents, and the CornerStep cutout on the rear bumper to make it easier to access the truck's bed. Like most full-size pickups, there is a range of engine, cab, bed and drivetrain options to choose from. Besides that are multiple trim levels. If you're looking for luxury, start with the High Country, which comes standard with the big V8, leather upholstery, navigation, Apple CarPlay, a premium audio system, and more. There are multiple other packages, such as the Midnight Edition, which comes in a cool all-black theme, or the Z71 off-road edition, which tones down the chrome grille. One option that isn't available at any price is push-button ignition, odd since it's available in the Silverado-based Tahoe SUV. If you order a Silverado Crew Cab with the NHT max towing package, you'll get best-in-class towing capability of 12,500 pounds. That bests the Tundra, F-150, Ram...everyone. Chevrolet will bill the Silverado's Wi-Fi capability as a feature for workers on the job site, and it's certainly useful there. But we know what it's really for: taking the Silverado on a road trip, and keeping the kids occupied with their tablets as you travel. There are three engine selections for the 2018 Chevrolet Silverado. The base engine is a 4.3-liter EcoTec3 V6, which leads in fuel economy, but seriously lags the others in horsepower; skip it. At the other end is the 6.2-liter V8, which handily out-powers everything else, but fuel economy suffers more than we prefer. The Goldilocks setup is the 5.3-liter V8, which offers more power than the V6, but better fuel economy than the bigger V8. All engines are available with 4-wheel drive (4WD) instead of the standard 2-wheel-drive (2WD) setup, and the standard 6-speed automatic gets supplanted with an 8-speed automatic with the 6.2-liter V8 and 5.3-liter V8 LTZ. Everything runs on regular unleaded, with the V6 and 5.3-liter V8 capable of running on E85 ethanol blend. 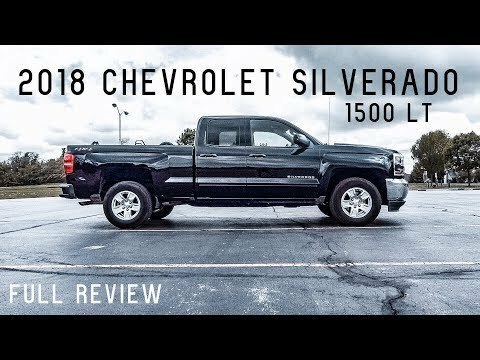 The 2018 Chevrolet Silverado brings tastefully conservative good looks, a range of engines and powertrain choices, and excellent towing and hauling capabilities to one of the toughest markets in the U.S. Chevrolet's reputation over the decades has made its Silverado pickup one of the top sellers, coming in at a perpetual number two behind the Ford F-150. But right behind it are the Ram 1500, Toyota Tundra, Nissan Titan, and even its sibling, the GMC Sierra. Prices and equipment span the gamut from a basic work truck costing less than $30,000 to a full-blown High Country with all the trimmings costing nearly twice that. While it doesn't offer a diesel, the Silverado's range of gas-powered engines keeps it competitive in fuel economy and power without sacrificing capability. Very strong and very steady, very safe to drive around. The car is amazing, strong, steady, big enough for your travel with your kids if you have bikes, scooters. . . It's great for camping, everything in the car is amazing, but if you have small garage this car will not be your best deal. If you have pampered kids that like to be super comfortable while going for a ride that will not be the best choice, as the back seats are stable and don't recline back, so the child will not be able to recline it back and sleep or just chill. Otherwise the car is amazing and I love it so much. Why my husband only drives a Chevrolet. My husband has driven a Chevrolet all of his life. They are a very reliable vehicle with amazing warranties and extended warranties. Chevrolet stands behind their products 100%. They have the best air conditioning systems and you especially need that in Texas. They also come with roadside assistance which is a very important thing to have. Also the comfort is above all others with plenty of legroom for both your front seat passenger as well as back seat passengers. Our Chevrolet also come with a backup camera which we love!! The trim color scheme interior. I love having such a pretty interior. No problems or issues. It is a great truck drives and rides nice allows me to haul anything for my yard and is handy when I yard sale. Would gladly recommend to anyone! Features are fast and easy to use the dealer was great spending time with me after the closed to explain all of the features would gladly purchase another my favorite two features would be the back up camera and the dash radio phone integration the only item I would suggest changing would be for the seat to sit higher for easier parking.